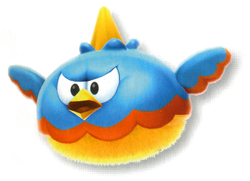 A Flaptack is a type of enemy in the game Super Mario Galaxy 2. Their name is a portmanteau of flap, referring to their bird-like appearance, and tack referring to the sharp spike on their head. Their name is also a pun on "flapjack", another name for a pancake. They look like oversized blue birds with a yellow spike on their head. When they spot Mario or Luigi, they will float around them for a while. After a few seconds, it will try to stab them with its spike on its head. If it misses, it will be stuck on the ground, defenseless. They can be defeated while still in the air by backflipping and Spinning into them. They give three Star Bits when spun and a coin when jumped on. These enemies can also destroy Cloud Mario or Cloud Luigi's clouds with its spike. They appear in early galaxies such as the Fluffy Bluff Galaxy and Cloudy Court Galaxy, but they also appear in later galaxies such as the Flash Black Galaxy. Their attack pattern is very similar to the Flaptor. Pyūdon Pyũ is sound of flying towards something, and don is that of colliding. ↑ Browne, Catherine. 2010. Super Mario Galaxy 2 Prima Premiere Edition guide. Page 26. This page was last edited on January 29, 2018, at 20:48.